When the other passengers were getting down with the help of the stairs, after that Radhika was slowly getting down. She immediately changes the thought that was wavering on her for such a long time. No, she will not keep in touch with Tonnoy any more. Wish Tonnoy had a happy life. And in doing this, will emerge the essence of true love. Before thinking about his happiness, Tonnoy should think of his wife’s happiness. If sadness comes to Radhika’s life … let it come, what is the problem in it? The love, with which her life has been invigorated with greenery, can never be washed away by the monsoon’s deluge. In her young days, the smell of hasnahana13 has occasionally bought about the pangs of separation. Now the love of Tonnoy will always remain in her life as fresh as the smell of Hasnahana. Since she loves herself and as such in this tragic moment, Radhika’s smell is not lost somewhere. Because she could laugh, she could hide the tears on the eyelide just like the never ending clouds of the monsoon. But again and again this tears comes out from her eyes even Radhika was not aware of it. Radhika became firm. She will never be a dust particle that could be easily wipped away by a broomstick. Rather she would agree with the fact that her mind’s empty Brindavan could turned into a desert … for which she has no repentation. In her future path of journey, if somewhere she gets distracted in life or if she has to surrender. And at that moment, when she has to face the struggles of life, then and there the following golden memories of her life will always act as sanjivani for her. On the other side of this life’s desert, there is the starry night. Muga Riha— traditional Assamese attire. Chadar- traditional Assamese attire worn by women. Phagun- a season in Assamese calender. Palash- large trees symbolise beauty, love and freshness. Modar- large trees with flowers that blooms in the phagun symbolise beauty. Shimolu- trees with flowers that bloom in the phagun symbolise beauty. Kadaam- large tree with sweet smelling flowers. Jakhya- a name of Kubera. Krishnasura- a name of a flower. Sanjivani- it refers to life saving medicinal plants that was mentioned in the Great Epic Ramayana. About the author: Jyotirekha Hazarika, a prolific writer writing in Assamese for quite some time. She is a poet, short story writer, critic and reviewer. Her writings are translated into many Indian and foreign languages. Those have been widely read all over the World. About the translator: Pranami Bania ,Senior Assistant Professor in the Dept. of English, J.B. College, Jorhat. She is a poet, translator, reviewer, and researcher. 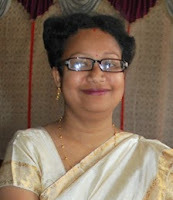 She is a bilingual poet, who writes in both English and Assamese. Her research papers are regularly published in many International and national journal. Translator’s view: It was quite difficult on my part to translate the novel written by renowned writer Dr. Jyotirekha Hazarika titled “Morubhumir Junak.’ As a translator, it was a new area of exploration for me because earlier I had tried a hand in translating poems. Literal translation is not always possible in translating a text. Sometimes the translator has used the source language intact as it might affect the meaning of the novel. Some words like­–Phagun, Vrindaban, modar, Shimalu has not been translated into English, rather the translator felt that its better to keep the original words so as to make it more effective and symbolic. Hope the readers will explore the journey of the writer through the translator’s eyes.